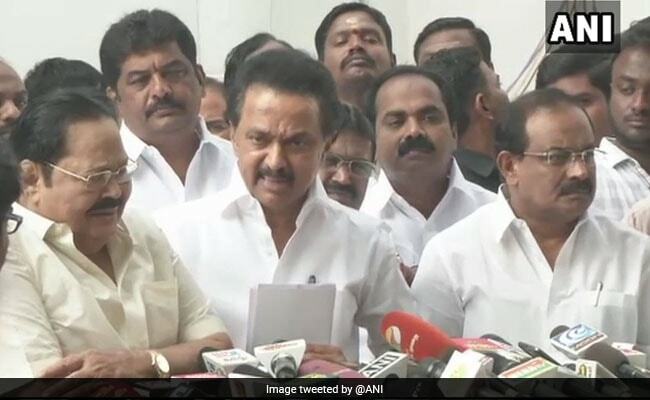 Chennai: The opposition DMK and the Congress today boycotted the governor's address on the first day of the Tamil Nadu assembly session this year. In a statement later, MK Stalin said, "Ruling AIADMK has no majority. The Governor generously allows government to continue. His review meetings in various districts raised doubts over the philosophy of democracy." Calling it a black day for democracy, MK Stalin said AIADMK has no support of the 18 disqualified legislators. "The Election Commission too has said the party has only 111 MLAs and the governor remains a mute spectator," Mr Stalin said. This is the first session after the ruling AIADMK's candidate was defeated in Chennai's RK Nagar by-poll, the constituency twice represented by late Chief Minister J Jayalalithaa. Sidelined AIADMK leader TTV Dhinakaran had won with a huge margin and made his debut in the assembly as a legislator. The DMK has planned to raise what it calls the failure of the state government in handling cyclone Ockhi and its aftermath, the ongoing transport strike and farmers issues.